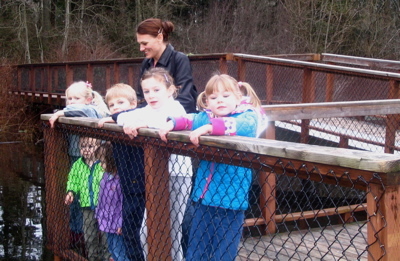 On our second day in Seattle, Margie and I took the kids to a little playground in an adjacent neighborhood. The playground was situated next to a little lake. 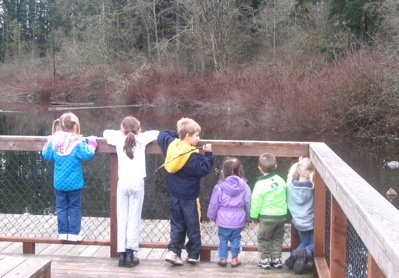 The kids enjoyed looking at the ducks and fishing with sticks. We decided to walk around the lake on the path, about a mile and a quarter in length. 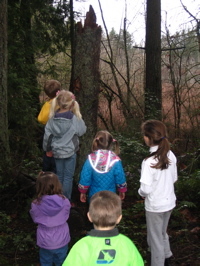 The kids were intrigued with this tree? What could live in an old hollow tree? Who made that hole in the trunk? 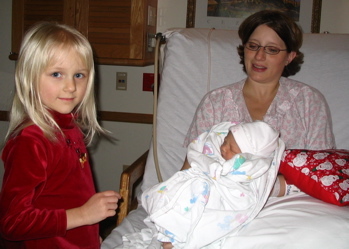 The three oldest kids -- Harrison, Lisette, and Emma --were constantly being told to slow up and wait for us. While the three younger kids -- Clare, Zach, and Annalise -- were being encouraged to keep up and walk faster. Everyone was asked not to step in the mud and the puddles. Basically all these requests were ignored. We were all very happy to reach the playground and get back into the warm car. The kids and I went up to Seattle to visit Margie and the cousins in their new house. All of the kids got into the new Magnetex toys. 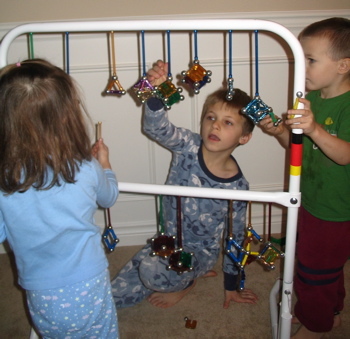 They discovered that they could hang their creations from the metal ballet bar. Margie and I were impressed. The kids also did a lot of dress up. Lisette directed Emma and Clare in a short version of the Nutcracker. It was actually pretty good. She also played school with Harrison and Emma. Of course she was the teacher. harrison and Emma sat at their little desks while she gave them assignments, kept them on task, graded their papers and handed out report cards. 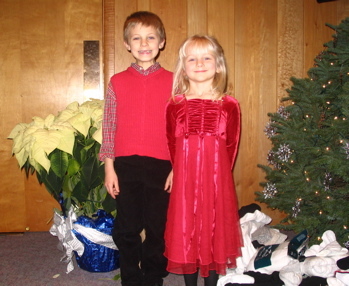 The funnies thing was how much Harrison and Emma loved being students, and how seriously they took their report cards. My family tradition is to open all presents on Christmas Eve. This is followed by a thorough picking up and putting away. The living room must be clean for Santa. Nice tradition, Mom. I appreciate it a lot more as a Mom, than I did as a kid. Santa then leaves unwrapped presents for the entire family under the tree and fills the stockings. About two weeks ago Harrison informed my that Santa is a myth. Those were his exact words. We had a long talk about how fun the myth can be, on both the receiving and giving end. 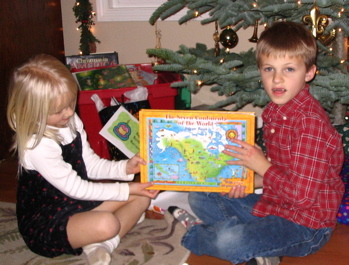 On Christmas morning Harrison received the gifts from Santa with a knowing smile in our direction. We all enjoyed dumping out our stockings. 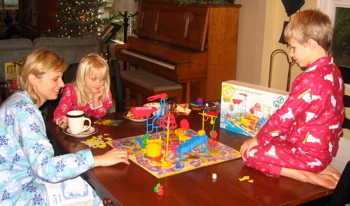 Then we played a quick game of Mouse Trap, another childhood favorite. The kids were all smiles after the church service. At church and through school money is regularly collected for those in need - hurricane victims, the homeless, or developing countries. Emma always responds with, "We don't know any poor people, do we?" And the truth is, we don't. Poverty is a pretty vague concept for my kids. So this year, along with Jeremy's immediate family, we adopted a family in need for Christmas. We bought clothing for each child and a couple of games for the family. On Christmas Eve morning we took out presents to the family's apartment in Canby. The mother, who had worked the night before until late, and had to go back to work in a couple of hours, nursed her baby on the couch. 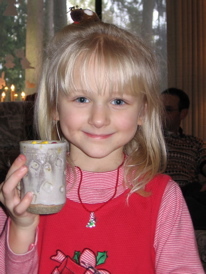 The other young children jumped around delighted with the gifts and plate of cookies. We stayed for just a few minutes, making small talk. I would like to make this a new tradition. The rest of the afternoon was spent at John and Louise's house. We ate a big meal at noon, unwrapped presents, and played games. Jeremy and I gave the kids each one present this year, besides the stuff from Santa. 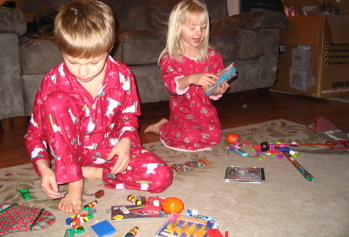 They also received presents from grandparents and aunts and uncles. 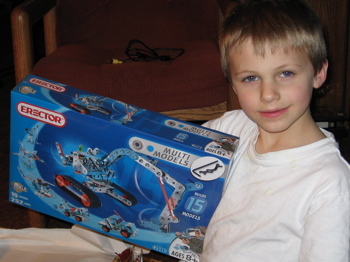 Harrison got an Erector Set. One of my favorite toys as a child. I still have it, but it is plastic and missing a few pieces. This new set is metal and much smaller. Should be fun for both of us. Emma asked for a Barbie. I find Barbie's focus on unrealistic beauty and materialism a little offensive. So I searched and found a more kid appropriate barbie-like doll from the Only Hearts Club. The doll came holding a little orange kitty. I'm happy to say she is very taken with this new doll and her outfits. Several years ago my mom gave me a stack of unfinished quilt tops found in my Grandma's house. I shared these treasures with the Gingerich women quilters. Carolyn loved the Christmas star, but it was in pretty sad shape, torn, worn out, and incomplete. 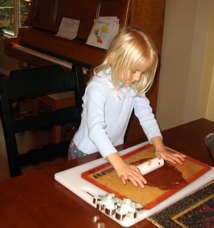 This year she decided to take on this quilting project. At the quilt store she was told that the quilt was probably from the 1800's. 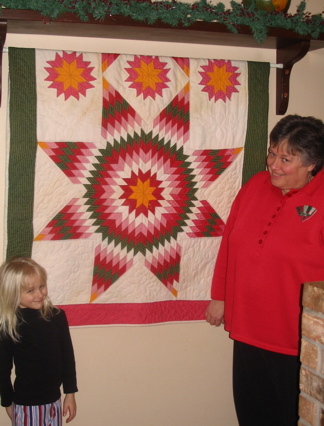 She matched fabrics, did some repair work, and hand quilted it with a beautiful feather pattern. I wish I knew more about the origin of this quilt. It's nice to think it was sewn by one of my ancestors long ago. Thank you Carolyn for your beautiful work! 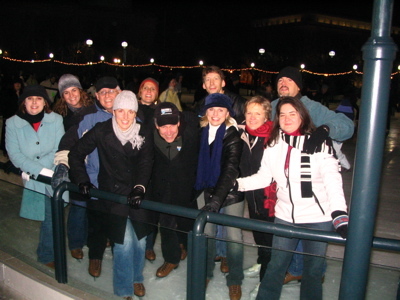 Here we all are ice skating at the Sculpture Garden. My ankles felt pretty unstable at first, but after a few spins around the ice, I got the hang of it. I even skated backwards for a short time! This was a lot of fun in the crisp winter air surrounded by the Capital Building and the Washington Monument. Wow! Somebody's been a busy little elf this holiday season: party hostess, trip to D.C. and now all of these blog entries! 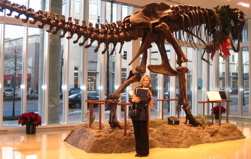 Here I am in Maryland at the Headquarters of Discovery Education. The lobby is really amazing with this large dino. In talking with the kids last night, Harrison asked if I was going to go straighten out the president. Well, I'm on my way to the White House in just a few minutes. More photos tomorrow! We are all so excited for Kim and Sabino who have a new little daughter, Isabel Pilar Arredondo. Emma and I would like one of these cute babies for Christmas, but that is not going to happen. I guess we'll just have to borrow Isabel every once in a while. 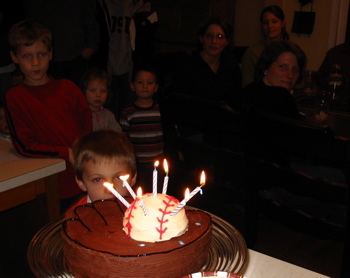 Each year the kids choose a cake, with a little direction from me, for their birthday. Harrison selected several and allowed me to make the final decision. I think it turned out great. We celebrated Harrison's birthday we lots of pasta and chocolate. He received lots of wonderful gifts for his birthday. 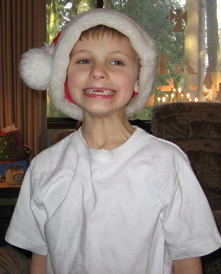 I think for Christmas what he really needs is two front teeth. 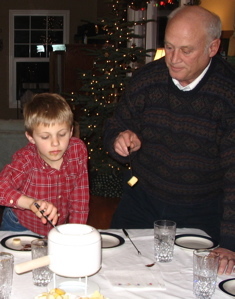 Grandpa and Harrison thoroughly enjoyed the fondue as a replacement for birthday cake. 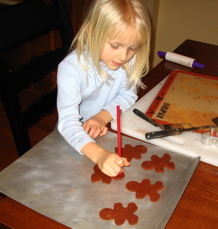 I love this Christmas craft. It is so simple and it makes everythin smell so good. You basically mix cinnamon and applesauce to form a dough. Roll out the dough, cut out the ornaments, and let fry. They smell good for years to come. The best part of the project is no sticky frsoting to mess with or sugar high to contend with. 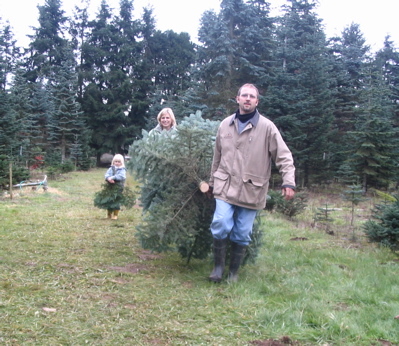 Harrison took this picture of us carrying the tree to the car. It is a beautiful noble fire and looks quite lovely in out house. I hope it doesn't turn into a noble FIRE! It's great to see the family from Hank's point of view. 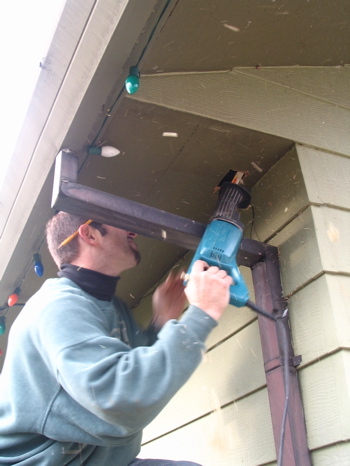 Jeremy, who sees every simple project as a chance for a major home renovation, decided to install outlets under the eaves to make putting up the Christmas lights easy. At leat in the future it will be easy. When the lights were plugged in and switches were flipped, the house looked a little like the one in the movie Christmas Vacation - EXTRA BRIGHT! Apparently Jeremy had wired them up to 220? The problem was fixedly quite quickly, but I think the story will remain for years to come. You gotta love Christmas lights, especially when you do them "Christmas Vacation" style.